You are here: Home / Blog / Hair Shaman Wisdom / Hair Transplants Kill Your Brain! Hair Transplants Kill Your Brain! This article post has an overall serious tone. What I have seen going on with hair transplants these past few years is absolutely horrific. I have seen first hand what negative effects hair transplants can have on people – I’ve had a few clients come to me after their transplants, unfortunately. So, please read on to educate yourself on what the doctors don’t tell you and/or don’t understand and please, please spread the word! survival. This follicle, or bulb, is in turn individually connected to a single nerve ending of your brain. These connections, collectively numbering in the tens of thousands, make possible the high level of thought, feeling and sensation you access every day to experience your world… thanks to such an amazing gift from Nature. Those who choose to have hair transplants done unwittingly subject themselves to irreparable damage they will inevitably live to regret — not to mention the fact that a very high percentage of these so-called ‘infallible’ transplants simply fail to produce hair growth at all. 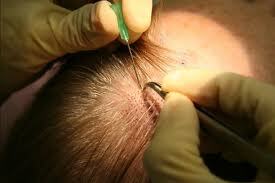 The procedure involves removing “plugs” from a dense area of hair to be “replanted” in a thinner or bald space. Each scalp chunk torn out represents one destroyed and irreplaceable nerve ending of your precious brain that is then gone forever. Certainly switching to an all-natural hair care regimen such as Morrocco Method International, which proudly presents the world’s only 100% natural, wild-crafted, raw and system — combined with the foregoing suggestions for enhancing your health — is vastly preferable to destroying your amazing brain! As always, thank you for reading. I hope you take this information to heart and help others to learn the damages that hair transplants may have on your life. https://www.thehairshaman.com/wp-content/uploads/2017/09/hair_implants.jpg 183 275 morroccomethod https://www.thehairshaman.com/wp-content/uploads/2017/06/HS-Logo-Final-No-Sig.png morroccomethod2017-09-06 10:42:482017-12-11 11:33:01Hair Transplants Kill Your Brain! Can Surgeries and Stress Make My Hair Fall Out?